Five people, three Europeans and two Malians, have been killed after gunmen raided a restaurant in Bamako, the capital of Mali, police have said. Two armed suspects have been arrested, according to a senior intelligence official. Armed commandos stormed the “La Terrasse” open-air bar in the Hippodrome district of Bamako late on Friday night, triggering a shootout in which a French national was killed. 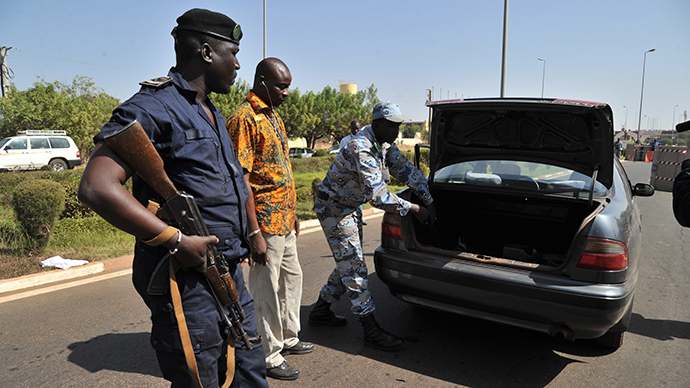 The attackers continued to fire in the vicinity of the restaurant, killing a Belgian citizen, as well as a police officer and a Malian property caretaker. The Belgian citizen was a security officer with the European Union delegation in Mali, EU Foreign Policy Chief Federica Mogherini said. "This is a terrorist attack, although we're waiting for clarification. Provisionally, there are four dead -- one French national, a Belgian and two Malians," a police officer told AFP. These four also include a policeman who had been passing the restaurant. A third European, whose nationality hasn’t been revealed, was dead on arrival at the Gabriel Toure hospital in Bamako, a hospital source told AFP, adding that eight people were injured in the assault. Witnesses on Twitter wrote that one of the assailants had been sitting in the restaurant before he opened fire. Following the onslaught, an accomplice reportedly picked the man up and they fled the scene on a motorbike. The two suspects were later arrested on a nearby street and "are in the process of being interrogated," a police source said, adding that they had started giving some "interesting" information. "The zone where the shooting took place is under the control of the security forces. The security forces are conducting an operation to ensure there are no other surprises," a source told Reuters. The restaurant on Princess Street is a popular area in the Malian capital, and is frequented by many European nationals. French and Belgian authorities condemned the shooting, with Belgium's Foreign Minister Didier Reynders saying, " it may be in any case a terrorist attack." French President Francois Hollande also denounced it as a "cowardly attack," according to a statement from the Elysee Palace, while the country’s Foreign Minister Laurent Fabius added that the assault reinforced France's resolve to "fight terrorism in all its forms." Almost two years after a French-led operation pushed Islamic militants from the north of the country, separatist groups continue to launch attacks in the area. The deployment of a 10,000-strong UN peacekeeping mission is still struggling to contain the violence, forcing a regional election in the country to be postponed for a second time.